Jarno's cousins wedding reception was celebrated aboard a ship sailing on Thames. 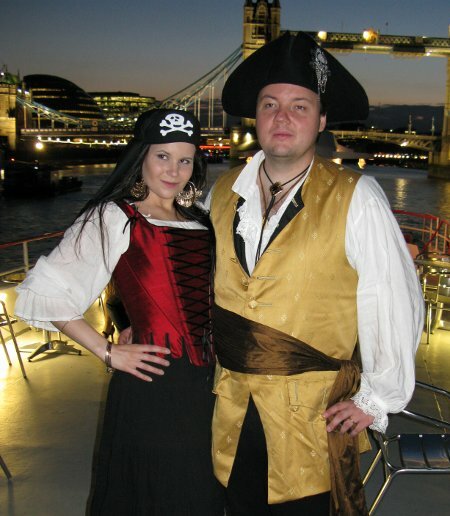 In the invitation they encouraged the quests to dress up according to the theme, for example as pirates. And of course we two freaks couldn't resist the temptation. I had already planned to make a fancy new pair 18th century stays (a project page can be found here), which of course would do well for a pirate wench too. Apart from that, most of the stuff for our outits we already had, so I just had to buy some little accessories. Captain Jarno wore his regular 18th century garb minus the coat - less to pack - with the addition of a silk sash. His brand new massive Jas. Townsend & Son tricorn was decorated with a skull-badge. It was a bit curious for him, though, to appear on a wedding unshaved and with his chest hair peeking from his collar! My outfit featured black boots, black flounced skirt and this peasant blouse, and of course the main eye catcher, the red and black stays. The jewellery is from H&M, and my work matey lent me the scarf-esque headwear with skull and crossbones - the perfect finishing touch! The wedding reception was very nice and we had lot's of fun. Even the weather happend to be favorable to admiring the landscape on the deck. And we were of course ridiculously overdressed, as always!